The leading road racing athletes of the 2015 season were crowned overall men and women's champions on Saturday, when the curtains came down on the 20th season of the Highland Spring College Classic Series on Tortola. The race focused on men's health and participants wore symbolic moustaches. "It was an excellent finish to the series and I was pleased with how it went overall in both Tortola and Virgin Gorda," Race director Stephanie Russ Penn said. "There were great finishes in determining the overall female champion and in some other divisions." While Reuben Stoby had locked up the men's overall division title heading into the finale, the women's division was wide open and the first woman crossing the line from among the top three in the standings, would walk away with the crown and that was Rosmond Johnson. Stoby won the finale in 11 minutes 33.73 seconds while Johnson was timed in 14:29.06. The Under 11 Division-formerly for U 9 runners-introduced this year, saw Sam Potgieter and A'keela McMaster taking the overall One Milers Division Boys and Girls titles. 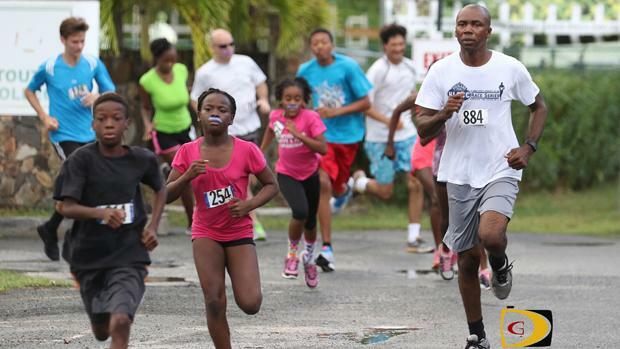 The Rotary Club of Tortola won its unprecedented 11th successive Cross Country title while Digicel landed the Community Partners Cross Country crown. "The many causes we have ended up supporting during the races I though have been really exciting and was a nice addition," Russ Penn stated. "At the beginning of the series, it was undetermined what we were going to do cause wise and so many things unfolded in that area and I really enjoyed both the competitive aspect of the race and persons also having the opportunity to come out and support worthy causes. I really liked that touch in terms of the quantity of causes we were able to bring awareness to." Russ Penn said the U11 One Mile Division-which previously targeted U9 participants-has seen the number of participants doubled. "It's a fairly big division -in a lot of races its close to 40 or 50 participants and in one race we had 60-and that's making up a fair bulk of the overall series in general," she said. "I think it's a much easier transition for the U11 participants who will move to the 2 Miles segment, because going from U9 into the 2 miles, it's a bit of a stretch and I believe it has been well received." "I'm continually thankful for how the series have been going and how the community supports the event," Russ Penn said. "I think it has been a great 20th year and I'm hoping it will continue to be a great community event in the years to come." Final Results: One Mile (Under 9 & 11), Boys: 1. Sam Potgieter, 7 minutes 44.38 seconds. 2. Kael Chalwell, 7:48.52. 3. Latriel Williams, 7:51.19. 4. Charlie Potgieter, 7:53.56. 5. Antuwn Maduro, 8:01.98. 6. Jamal Harry, 8:02.50. 7. Noah Cottreau, 8:29.65. 8. Jahnare Farrington, 8:38.62. 9. Tom Bridson, 9:20.34. 10. Owen Graham, 9:32.69. 11. Zaed Chalwell, 9:42.78. 12. Koda Lake, 11:11.60. 13. Seth Dobbie, 12:43.56. 14. Frank Carroll, 12:47.94. 15. T'Cari John, 12:53.28. 16. Declan Wheatley, 15:20.83. 17. Benjamin Cook. Girls: 1. A'Keela McMaster, 7:24.58. 2. Asia McMaster, 7:59.85. 3. Kenniqua Grate, 8:05.34. 4. Cheyanne Castello, 9:07.25. 5. Martha Killourhy, 9:08.52. 6. Taryn Augustine, 9:43.01. 7. Kassidy Penn, 9:48.58. 8. Kate Looney, 10:12.34. 9. Z'Hara McClean, 11:27.75. 10. Kassa Lake, 11:35.65. 11. Kei Lake, 11:35.97. 12. Hailey McMaster, 12:17.09. 13. Hana Bridson, 12:24.29. 14. Millie Cottreau, 12:43.89. 15. Lilly Smith, 12:46.22. 16. M'Kenzie Crabbe, 12:52.69. 17. Destiny Davis, 12:55.57. 18. Moya Carragher, 13:24.19. 19. Amia Wheatley, 15:11.69. 20. Felicity Means, 15: 49.84. 21. Catrin Jones, 16:17.91. 22. Ava Ghiorse, 17:02.56. 23. Olivia Cook. Women: 1. Rosmond Johnson, 14:29.06. 2. Kyra Romney, 15:13.08. 3. Juliane Potgieter, 15:13.50. 4. Kay Reddy, 15:28.53. 5. Gillian Plaxton, 15:40.27. 6. Laura Dore, 17:02.79. 7. Philomena Robertson, 17:32.81. 8. Cayley Smit, 18:38.66. 9. Saungie Liburd, 18:44.27. 10. Sarah Duncan, 19:14.59. 11. Roslyn Gilbert, 19:45.25. 12. Lucy Hannett, 21:52.64. 13. Christina Creque, 22:50.72. 14. Michelle Dennis, 22:52.34. 15. Shirley Liburd, 23:38.25. 16. Sophie Dabbs, 24:07.24. 17. Kimberly Cordes, 30:23.66. 18. Jennifer Thomas, 31:35.39. 19. Deborah James, 33:07.72. 20. Urenna Butler, 33:35.09. 1. Kenroy Joseph (FLPS), 15:29.87. 2. Malike Romney (AMPS), 15:31.53. 3. Jahshani Farrington (FLPS), 15:31.85. 4. Jaden Augustine (PG), 15:38.52. 5. Chad Willock (PG), 15:47.63. 6. Kendi Brewley (AMPS), 16:28.43. 7. Quiandre Pitt (WWPS), 16:46.96. 8. Johnibel Richards (FLPS), 17: 26.60. 9. Kavon Wheatley (FLPS), 17:39.13. 10. Jahtivya Williams (ASPS), 11. M'Khori Crabbe (JSPS), 19:06.25. 12. Jhanna Davis (JSPS), 22:14.37. 13. Sanjay Henry (JSPS), 22:16.08. 14. Makela Gumbs (JSPS), 22:17.43. 15. Kieanjah Roberts (JSPS), 22:17.80. 16. Abriel Magloire (ASPS), 22:48.76. 17. K'hanni Daniel (JSPS), 22:53.33. 18. Deshawn Doley, 28:47.90. Points: 1. Joyce Samuel Primary, 69. 2. Francis Lettsome-1, 12 (3 participants). 3. Alexandrina Maduro Primary, 8 (2 participants). 4. Pelican Gate, 9 (2 participants). 5. Althea Scattliffe Primary Team, 27 ( 2 participants). 6. Francis Lettsome-2, 27 ( 2 participants), 7. Willard Wheatley, 7 (1 participant). 8. Cedar School, 12 (1 participant). Secondary Schools Teams: Cedar School (CS), Elmore Stoutt Carlisle House (C), St. Georges (St.G): 1. Liam Blok (CS), 12:47.93. 2. John Pettigrew (CS), 18:38.34. 3. Aria Creque (CS), 29:06.01. Service Clubs: Rotaract Club (RC), Rotary of Road Town (RR), Rotary Sunrise of Road Town (RS), Rotary of Tortola, (RT): 1. Michael Killourhy (RT), 12:48.25. 2. Stacy-Ann Wynter (RT), 16:31.15. 3. Warren Wintz (RT), 16:56.55. 4. Elvis Harrigan (RR), 17:40.62. 5. Ryan Geluk (RR), 18:02.10. 6. Brian Liverpool Jr. (RR), 18:42.22. 7. Lorna Smith (RT), 19:08.12. 8. Corazon Fos (RR), 21:46.55. 9. Louis Schwartz (RT), 24:43.78. 10. Anthony Clarke (RR) 32:10.78. 11. Lavina Liburd (RR), 33:43.59. 12. Henry Creque (RT), 35:34.93. Points: 1. Rotary of Tortola, 22. 2. Rotary of Road Town, 33. Community Partners: BVI Tourist Board, Cedar School Parents/Teachers (CSPT), Digicel (D), Limitless Fitness (LF), H. Lavity Stoutt Community College (HLSCC), 1. Tommy Farrell (D), 13:24.18. 2. Brendan Menton (D), 15:34.65. 3. Kevin Carragher (D), 15:56.99. 4. Rhiannon Jones (CSPT), 17:00.00. 5. Elaine Burke (D), 17:08.76. 6. Ariana Forbes (LF), 18:01.47. 7. Lisa Bridson (CSPT), 18:05.69. 8. Conor Looney (D), 18:25.15. 9. Jessica Santos (CSPT), 18:27.68. 10. Garfield Neita (CSPT), 18:55.70. 11. Barbara Rhoden (CSPT), 18:57.21. 12. Natasha Chalwell (TB), 19:16.34. 13. Patricia Casares (D), 23:10.46. 14. Liloutie Ramphel (D), 23:26.91. 15. Bernice Magloire (D), 25:51.83. 16. Karl Dawson (HLSCC), 26:57.71. 17. Ella Christopher (D), 27:15.91. Points: 1. Digicel, 19. 2. Cedar School Parents/Teachers, 41. 3. Limitless Fitness, 6 (1 participant). 4. BVI Tourist Board, 12 (1 participant). 5. HLSCC, 16 (1 participant). 2015 champions. Overall Men: 1. Reuben Stoby. 2. Julius Farley, 3. Samuel Romney. Women: 1. Rosmond Johnson. 2. Kyra Romney. 3. Juliane Potgieter. One Mile Champs Overall: Boys. Sam Potgieter. 2. Latirel Williams. 3. Kael Chalwell. Girls: A'keela McMaster. 2. Asia McMaster & Kenyatta Grate, 3. Kenniqua Grate. U9 Boys: 1. Sam Potgieter. 2. Latriel Williams, 3. Charlie Potgieter. Girls: A'Sia McMaster: 2. Kenniqua Grate, 3. Martha Killourhy & Taryn Augustine. U11 Boys: Jahnare Farrington, Kael Chalwell. 2. Antuwn Maduro, 3. Noah Cottreau. Girls: A'keela McMaster. 2. Kenyatta Grate, 3. Cheyanne Castello. U13 Boys: Christina Creque. U15 Boys: Ikyjah Williams. 2. John Cullimre. Girls: Kyra Romney. U17 Boys: Samuel Romney. 20-29 Men: Aaron Harry. Women: Michelle Dennis. 30- 39 Men: Reuben Stoby. 2. Julius Farley, 3. Claudius Rymer. Women: Juliane Potgieter. 2. Sarah Duncan. 40-49 Men: Zebalon McLean. 2. Chris Graham, 3. Kenton Brewley & Damian Creque. Women: Rosmond Johnson. 2. Laura Dore & Philomena Robertson, 3. Roslyn Gilbert. 50-59 Men: Dave Pettigrew. 2. Howard Moore & Elvette Dore Sr. 3. Stephen Beard. Women: Kay Reddy. 60+ Men: Jim Cullimore. 2. Barry Leon. Women: Shirley Liburd. 2. Deborah James. Cross Country. Primary Schools: Joyce Samuel and Francis Lettsome. 2. Pelican Gate, 3. Alexandrina Maduro. High School: Cedar. Community Partners: Team Digicel. 2. Cedar Parents/Staff, 3. Limitless Fitness. Service Clubs: Rotary Club of Tortola. 2. Rotary of Road Town, 3. Rotaract.